I’ve built 30+ boats as a hobby so I know enough to be dangerous. 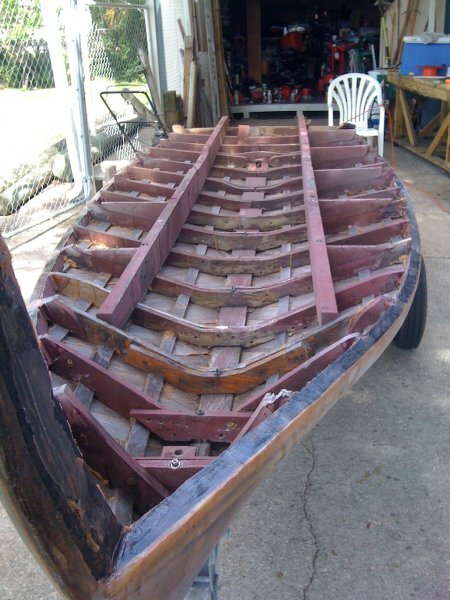 A few years ago someone decided I needed yet “another” project so they donated a 19402 era Chris Craft (I think) mahogany planked hull. The problem was it was only the heavy wooden planking below the waterline and had nothing but the ribs holding it’s shape. Anyway I recognized the beauty of the hull shape and knew whatever I built on top the boat would perform like the Chris Craft did. I stored it for a few years but got tired of seeing it sleep in the back yard. So I built a self-designed “1/2 Fast Cruiser” (name has nothing to do with it’s speed) on top of it. I was using a self-built “Bolger-Microtrawler” and wanted to incorporate many of those attributes into my design. Standing headroom, ability to sleep aboard, pilot house protection from the elements, and shade throughout, and the ability to do more than hull speed were “have-to-have” parts of the design. I like to do long distance cruising for a week or two at a time but like being able to cover more distance by kicking it up on a plane when I get to the wide areas where there's not much detail to be seen. Cruising the Mississippi Barrier Islands from Pensacola Florida is one of the examples of trips I like to do. Consequently, I incorporated all those features into my design and was lucky enough to end up with something that looks pretty good at the end of the day. I usually gaudy-up my boats cause they always attract lots of attention and it’s not like you can hide anyway. I use the same color scheme on the larger boats. My wife calls them “Boat shaped Mexican Flags”. My “1/2 Fast” Cruiser (the name has nothing to do with speed;-) is 18′ long and has a 6′ beam. 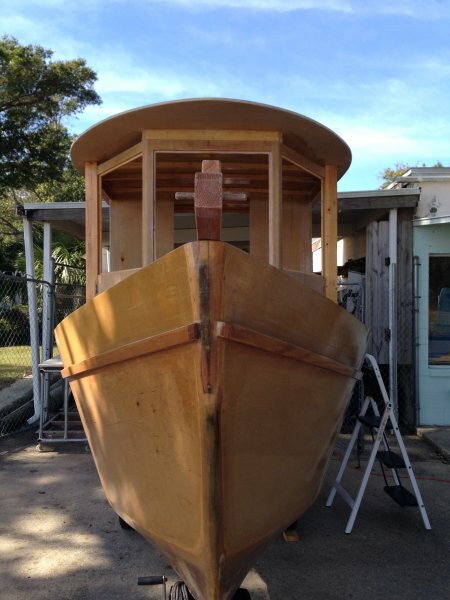 She weighs 1200 pounds dry without the engine and about 2000 at cruising weight. The parts above the waterline are all fiber-glassed 1/2 inch plywood. 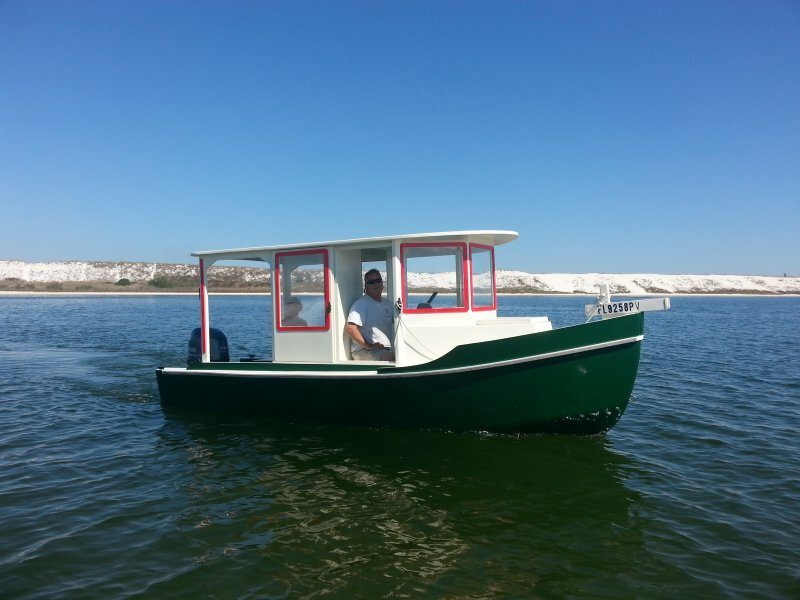 Once the boat was done I installed a new 4-stroke 70hp Yamaha outboard on the transom. I don’t like to go too fast on the water and about 25mph is my high limit but the boat will do 35 mph top speed in smooth waters. 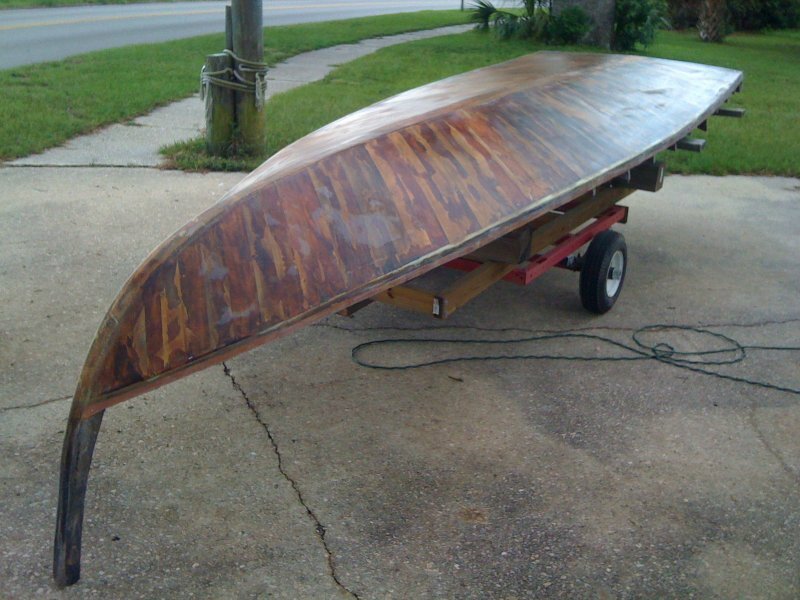 She will cruise comfortably in a 20mph wind and chop at 7mph (my typical cruising speed). I get just short of 10 mile to a gallon of fuel at 25mph or 7mph. I have a filler that makes the entire pilot house deck a V-birth for sleeping and there is a porta-poti under the front passenger seat. I installed sliding doors that open in nice weather providing a open-jeep-like seating arrangement for each of the 2 side seats.